VOLTA NY is an invitational fair with a unique focus on solo artist projects. It is a curated event that is fashioned to reflect a sequence of intense studio visits. 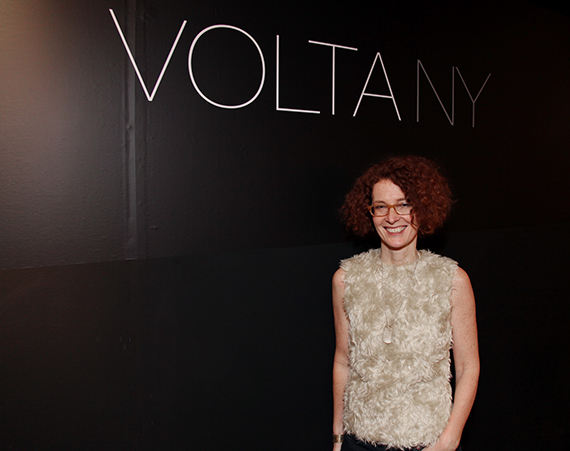 With VOLTA NY only a few weeks away, we reached out to Amanda Coulson, co-founder and artistic director of VOLTA, who talked to us about the motivation for starting VOLTA in Basel and subsequently NY, her artistic goals, and the fair gallery-partnership. VOLTA started in Basel in 2005 by 3 dealers - Kavi Gupta, Friedrich Loock and Uli Voges - and myself. At the time, several more international markets had just opened and it was getting harder for yet another gallery from Berlin or Chicago, cities with a plethora of contemporary art spaces, to get into Art Basel, as "spare" places were being taken by galleries from Shanghai, Mumbai, Cape Town. There was only one satellite fair, Liste, which was branded as the "young" art fair. I have always enjoyed it but it was located in an old brewery that made it feel like an end-of-the-year show at an art school; we felt galleries deserved a more mature and finished environment. Liste also had an age cut-off; the artists couldn't be older than 40 and the galleries could not be more than 5 years old. This seemed an arbitrary decision since there were many galleries that had been working with emerging artists for 8 or 10 years and were still very innovative. They were not ready for Art Basel yet, but they were "too old" for Liste. There was this kind of obsession with youth at that time, that still exists today, but what does youth have to do with it? Youth does not mean that you are automatically more original. It just means that perhaps you are more naïve. This needs to be said for both artists and art dealers. So there were galleries that were left out of the dialogue and they needed a platform. This is why we founded VOLTA and he response was overwhelmingly positive. At the first edition of each fair we had very reduced numbers; in Basel in 2005 we had 23 galleries and in NY, in 2008, we had 45 galleries. When you have these numbers you can really "curate" the fair, but when you reach 75-95 galleries, like now, it becomes very hard to have this kind of approach. In NY, the first three editions had an actual theme, since we wanted the fair to be almost like an exhibition. As we grew, however, it became a compromise between dealers' expectations of the fair and what the fair can do while remaining true to its goals. I still have the same artistic goals I had when we started, that is, I still want to see a booth that is what you would see at a gallery. Our galleries are very often presenting themselves for the first time to a collector base they haven't yet reached, so I always tell them that they should present what they do at their gallery. There, they curate solos or group shows that have an actual theme, not random groupings. I think this is important, so I talk to the galleries about their proposals and make suggestions. Also, in placing the fair, I aim to create a dialogue among the booths themselves. Since we started, we have always said that VOLTA was a fair by galleries for galleries. We approached it from a gallery's point of view not a fair management point of view. Fair management has one specific goal: how do I sell as much floor space as possible? Of course, if you are running a business you have to bear that in mind, but all along we have focused on what galleries need to be successful. They come here to do business, so how can we support them? Because if we support them, they will be happy and they will come back next year and we will both benefit. For example, here is how we approached the fair catalogue: The cost of printing a 4-colour catalogue with binding is typically part of the price of the booth. It has to be sent to the printer 2-3 months before the fair; the gallery sends images, but these will likely not be the actual artwork in the booth because the work hasn't been completed yet. The gallery paying for such a catalogue gets one copy. We thought that this approach does not really help galleries as a selling tool, or collectors. So what we do instead is print 1,000 leaflets for each gallery. We can print them just 4 weeks before the fair and this way it's more useful for collectors as well. After the fair, they can see what they saw at the booth. Also, every year after the fair, we send an email to the galleries. We ask: This is what we did this year and this is how we are thinking of approaching it next year. What do you think? We have a small but very active team and we keep the dialogue with the galleries open throughout the year since the galleries are our focus. VOLTA Basel grew very organically. The first year, we started with galleries we knew and invited; the second year, galleries were applying and we now have about 300 applications for about 75 spaces. It is a tremendous effort to go through all the applications. We were invited to form the fair in NY because the company that owns The Armory Show also purchased VOLTA. At the time, there were already 6-7 other fairs in NY. We thought, how do we differentiate our fair from existing ones? We decided to position VOLTA as the "sister" fair to the Armory. The fair you would visit directly before or after The Armory Show to see the artists who would be there in five years. We decided to have highly-curated, single artist booths at VOLTA NY. When you are a satellite fair you have to realize that people will come to you second, or third, or fourth. So you have to offer something refreshing. We decided to limit the number of artists, to keep it manageable, to make it a pleasant experience. This was our thinking. Unlike Basel, it is not a public application process, to keep it tight; we select the galleries to invite. When we say that VOLTA is a "curated" fair, we also mean that we look whether the gallery has a serious relationship with the artist and this is what makes us strong. We are a very small team of five and we have been doing this together for ten years. This very personal touch is one of the reasons both collectors and galleries like the fair. This year we have introduced a new section at VOLTA NY. We invited a NY-based curator, Derrick Adams, to curate an exhibition within the fair. We are bringing in some experimental work and revisit the idea of contextualizing the artwork. It is very exciting and it helps to diversify the fair, as I really want the fair to reflect the city that hosts us. It is also important to note that a fair of any kind goes back to that medieval idea of the market. The marketplace was an event. People would go every three or six months to do business, do their shopping, but also to meet their friends. It is important to note that the fair feels very accessible to the general public. Fairs need to attract collectors and museum curators because it helps the artists' careers, but art fairs also have a role in educating the public, so I feel they are a very valuable resource. Even if it is not the ideal viewing conditions, it is often the first point of entry. People get to see art from all over the world. Fairs are part of an ecosystem that includes museums, galleries, curators, and artists and I believe that every part of this ecosystem is valuable. VOLTA NY, March 2-6, 2016, Pier 90, New York.